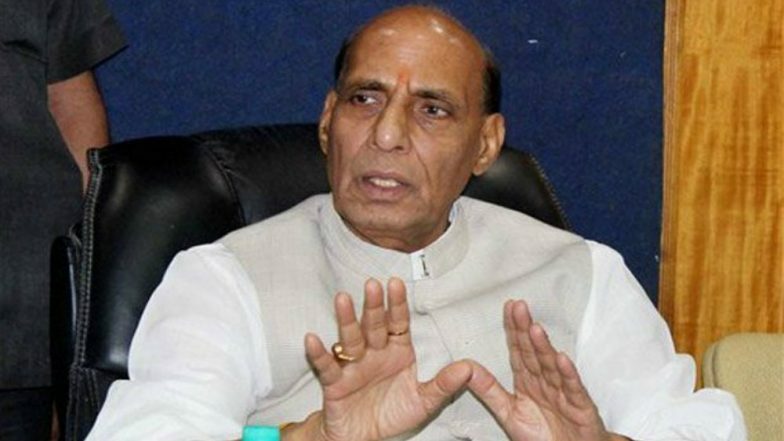 New Delhi, March 19: Home Minister Rajnath Singh on Tuesday said that he would not celebrate the festival of Holi because of the February 14 Pulwama attack in which 40 Central Reserve Police Force (CRPF) soldiers were martyred. Pakistan based terror organisation had Jaish-e-Mohammed claimed the responsibility of the attack. JeM terrorist Aadil Ahmed Dar carried out the suicide attack. Brij Holi 2019 Dates and Calendar: Know The Schedule of Holi Festival Celebrations in Religious Towns of Mathura and Vrindavan in UP. Almost two weeks after the attack, on February 26, the Indian Air Force (IAF) destroyed JeM terror camps in Pakistan’s Balakot. A day after the IAF’s strikes, Pakistan Air Force’s (PAF's) F-16 fighter jets tried to enter into the Indian airspace following which the IAF's Mig-21, Sukhoi 30 MKI and Mirage 2000 fighters planes were pressed into combat operation to chase away the Pakistani jets. IAF Wing Commander Abhinandan Varthaman Returns From Pakistan Via Attari Wagah Border; India Celebrates; See Pic & Video. In the ensuing battle, IAF Pilot Abhinandan Varthaman shot down Pakistan’s F-16 before his MiG-21 Bison got hit. His parachute landed on the other side of the border and the IAF pilot was taken into custody by the Pakistani Army. On the same day, Pakistan released photos and videos of the Indian pilot, thereby violating the Geneva Convention. Wg Cdr Varthaman was released by the neighbouring country March 1, 2019. Meanwhile, in 2014 also, Prime Minister Narendra Modi did not celebrate his birthday because of the floods in Jammu and Kashmir. That time he had appealed to friends and well-wishers not to celebrate his birthday and instead dedicate time and resources towards relief work.